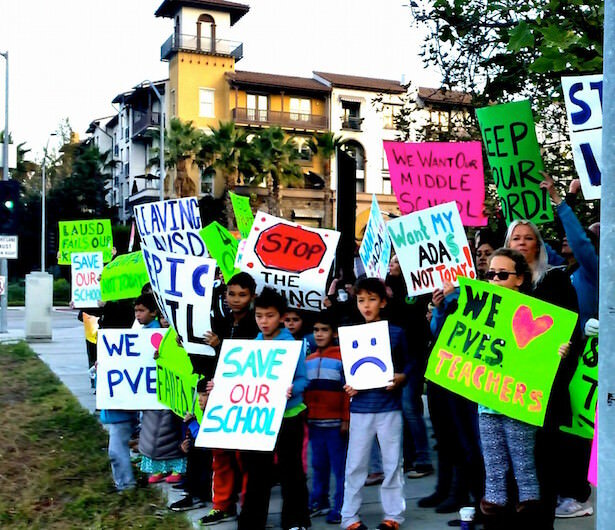 Parents and students at Playa Vista Elementary staged a protest today over an unexpected change in the district’s Westside expansion efforts that directly affect Playa students. Some families held a “sit out” and kept their kids out of school. The LA Unified school board is scheduled to vote tomorrow on an expansion plan for Playa that also involves shuffling at several other school sites. Parents say the district is making last-minute changes and breaking promises that were made over the last year through a series of negotiations and community meetings. “To fold this quickly was really surprising to us,” Alex Stein, a parent leader at Playa, told LA School Report. The protesters say the district vowed to create a second middle school on the campus of nearby Orville Wright Middle School, aligning the new school’s program with the STEM program at Playa, which was developed in partnership with Loyola Marymount University. But now, according to materials for the board meeting and a memo last week from Superintendent Ramon Cortines, the new plan calls for a second “program” on the campus at Orville that will be developed, based on of the curriculum of several elementary feeder schools, not just Playa, and the program will not have its own administrator. Stein said board President Steve Zimmer, who represents the area of the schools in question, presented the plan last month at a community meeting at Orville and expressed support for it. It is unclear if Zimmer supports the changes, and he did not respond to a request for comment. The district’s communications office said the district and Cortines have no comment. A meeting was held yesterday at Playa, attended by the local area district superintendent, Cheryl Hildreth. Stein said she did not fully explain why the second school was taken out of the plan. “It’s basically an 11th hour switch that throws everything in doubt,” he said. Orville is a magnet school with a STEAM program (science, technology, engineering, arts and math), but many of the parents at Playa say they do not want to send their children there, according a press release from Friends of Playa Vista School, a parent booster organization. Orville students scored below the state and district average on the recent California Assessment of Student Progress and Performance (CAASPP) standardized test, with only 16 percent of students meeting or exceeding the math standards. Playa Vista is currently operating at or near its capacity, with enrollment only expected to grow due to new housing under development in the area, according to the district’s Playa Vista Area Enrollment Growth Plan, a complicated measure that involves shifting students and programs at four different Westside schools. Under the plan — hang on — Playa will have four new classrooms by 2020 for its kindergarten through 3rd grade students at a cost of $7.68 million. Playa students in grades four and five will be moved to a satellite campus at Orville, which will also have five classrooms ungraded to science labs by 2018 at a cost of $2.57 million. The Westside Innovation School House (WISH), a charter school co-located at Orville, will be moved to Emerson Adult Learning Center, and Emerson will be moved to one or multiple locations, possibly Westchester Enriched Sciences Magnets high school. The district is currently looking at budget shortfalls in the coming years, due in part to declining enrollment as more parents are choosing charter schools over traditional schools. At Playa, a traditional school, the district is seeing the opposite problem, with overcrowding due to its highly regarded STEM program. But Stein said the district’s current plan for Playa will just drive parents away.